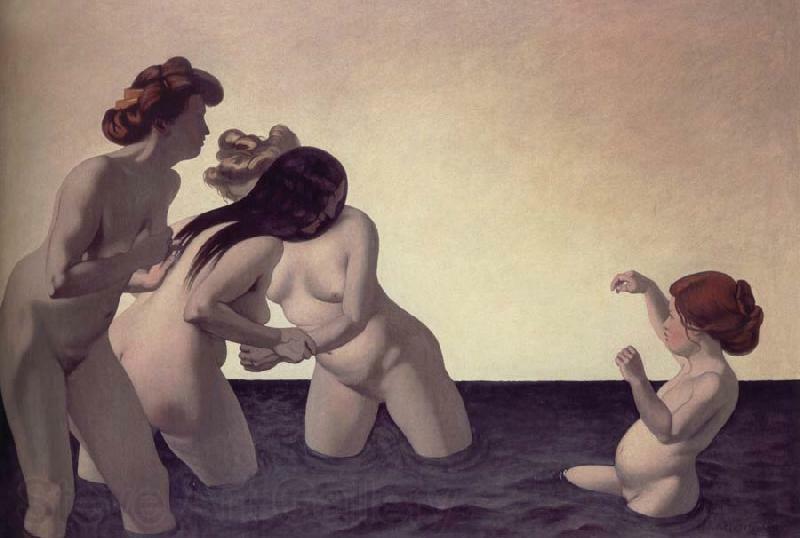 The work of Félix Edouard Vallotton generally is divided in two different periods. From 1895, the artist associated himself to the group Les nabis who, as we saw in previous posts, fuse the fauvist and expressionist styles. But from middle 1900s, Vallotton’s style became more sober and less spontaneous. He left bright and flat colors at the same time he would refine his technique. Because of this, the paintings from this period resulted more classical and naturalistic. Three women and a young girl playing in the water is an example of this last period. The title of the work is descriptive of what we see in it: 4 naked characters playing in a lake. Each of the women at the left has her own hair color and their faces are hidden from the spectator. Shadow bathes the front of the woman in the foreground, allowing us to see only the silhouette of her face. As by chance, neither can we observe the faces of the two women struggling friendly in the background. The girl at the right, although young, has characteristics of an older woman and seems curiously disproportionate, especially in her breasts, which seem fully developed; and in her abdomen, which seems swollen. Vallotton’s late work received many critics. One claimed that he painted “like a policeman” because of the stiffness of the lines and the lack of intensity of the colors he used. Even so, Vallotton is considered as a precedent of the New objectivity, movement that flourished in Germany in the 20s. ~ by Álvaro Mazzino on May 3, 2011. HTC’s starting to push some of that info to your lock screen as well, starting with Yelp: when you’re out and about, and it’s almost meal-time, you’ll get recommendations for where to go. There’s lots more to come, too. The Galaxy Tab E has a 1.3 GHz quad-core processor, 1.5GB of RAM, 8GB of storage, a 5,000 mAh battery, 802.11b/g/n WiFi, Bluetooth 4.0, a 5MP rear camera, a 2MP front camera, and a microSD card slot. This entry was posted on May 3, 2011 at 09:40 and is filed under Expresionism, Fauvism.You can follow any responses to this entry through the RSS 2.0 feed.You can leave a response, or trackback from your own site.